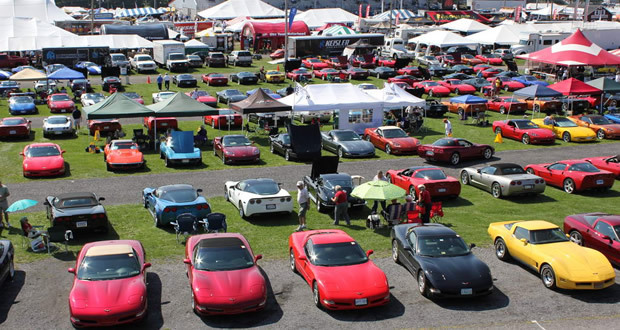 CARLISLE, PA – When Corvettes at Carlisle takes place August 22-24 at the Carlisle PA Fairgrounds this year, once more the future of the brand will be on display, while at the same time, the historic timeline of America’s Sports Car will also be highlighted. With special guests, displays and weekend happenings, Corvettes at Carlisle remains the MUST DO event for every red blooded American. This year at Carlisle, honor 50 years of the 1964 Corvette, embrace your “need for speed” via a pair of race-themed displays and of course catch the rare Corvettes that you’ve either never heard about or have only read about. It’s all at Carlisle starting the next to last weekend in August. On paper, Corvettes at Carlisle is three days but for some it’s a week-long celebration. Corvettes come and go onsite in the days leading up to the event’s official opening day, but Thursday serves as the official vendor set up day and display load in. Enthusiasts come to the event from nearly every state and annually there is a large international audience too. People come to Carlisle to experience the huge Fun Field or the NCCC and their 7-sanctions judging. Also, for free to everyone, including members of the Carlisle community, the NCRS is hosting its NCRS Gallery XIV (14) within Building G just outside of Gate 1. And, of course, the Corvette swap meet and car corral sales area is unmatched. Hot cars onsite include a showcase of the all-new Z06 coupe and convertible. These cars are pre-production models and aren’t available to be seen anywhere at this point. They’ll perfectly compliment the array of C7 Stingrays, which were a hot draw in 2013 too. Onsite displays include Chip’s Choice, a Corvette Challenge showcase, 1964 Corvette reunion that includes a mid-engine gem known as the CERV II and dedicated racecar showcase. The Corvette Challenge display honors 25 years of the popular racing series and for Chip’s Choice, this popular exhibit highlights cars that are relationship based, meaning the car brought people closer together, and the race car display hosts a full spotlight of Corvette racing history. Included will be the Purple People Corvette, 1960 #3 Cunningham Corvette, 1966 Penske Corvette that was the only mid-year Corvette to win the same consecutive year at Daytona & Sebring, a 1968 Factory L88 Sunray DX Racer and more. Plus along with the cars come some of the drivers, crew members and team owners too. There is even a special dinner slated for Friday and a special Thursday kickoff known as Chip Fest. Not only do guests come to Carlisle for the cars, but those who’ve help build them also are a popular draw. Seminars are always popular, with GM Certified Technician Paul Koerner of Corvette Repair, Inc. showcasing his talents throughout the weekend. A nominal fee apples for Koerner’s sessions, but that money goes directly to the Chip Miller Charitable Foundation. Finally, with the onsite fun, don’t forget about the always-popular downtown Carlisle Corvette parade and street party. At least 400 cars cruise from the fairgrounds into the downtown area on Saturday night for a few hours of community-based automotive excitement. Get closer than ever before to these cars, speak with their owners, enjoy a night on the town filled with dining, shopping and camaraderie, plus dance in the streets with live music from the M80s Band. The Saturday parade and Sunday awards showcase provide the perfect cap to a spectacular Corvette-based weekend. Registration details for the event can be found at Carlisle Collector Car Swap Meets & Enthusiast Events or by calling 717-243-7855. There, enthusiasts can secure a swap meet space, buy a car corral spot, register for the Fun Field, the parade or get involved with special aspects of the event. In addition, three-day passes are available for just $35. About Carlisle Events: Carlisle Events is a partner or producer of 14 annual collector car, truck and outdoor-themed events. Events are held at the Carlisle PA Fairgrounds (Carlisle, PA), Bloomsburg Fairgrounds (Bloomsburg, PA), Allentown Fairgrounds (Allentown, PA) and Festival Park (Zephyrhills, FL). The season schedule hosts a sports and outdoors event, five automotive swap meets of varying size, four auctions, as well as individual specialty shows featuring Corvettes, Fords, GMs, Chryslers, trucks, imports and kit cars and tuner and modern customs. Founded in 1974 by friends Bill Miller and Chip Miller, events hosted at Carlisle attract more than a half a million enthusiasts annually from all corners of the globe. More information is available via Carlisle Collector Car Swap Meets & Enthusiast Events or Collector Car Auction | Zephyrhills Auto Auction. next Could a mid-engine Corvette called the "Zora" be in the works?